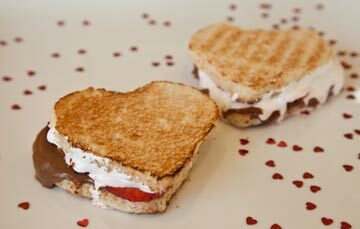 Pictured is PBandU’s Sandwich of the Month: Chocolate Peanut Butter, Strawberries and Fluff! Since it opened in the summer of 2010, Wayne’s funky and fun eatery, PBandU, has become a staple of Main Line moms, teenagers and everyone who has a love for all things peanut butter—and purposefully creative. The concept has caught on so well owner Mercury Amodio opened a second location last week in the Moorestown (NJ) Mall! Located in the heart of downtown Wayne, PBandU enables you to create a peanut butter experience that’s anything but ordinary. Foodies can enjoy an endless array of combinations—from jelly to bananas, bacon, pickles and more! Now two lucky AroundMainLine.com fans have a chance to win a $25 gift certificate to PBandU! Comment here by noon, Saturday, February 18th for a chance to treat yourself to a great experience at PBandU! Two winners will be selected to receive a $25 gift certificate. Click here to read the full profile on PBandU on AML. I have a slight PB obsession…ok…maybe a little more than slight. Hope I win! such a fun little place. we love it there! Can’t wait to try PBandU! I LOVE PEANUT BUTTER!!!!!!!! I would love to try this place out. Yum! We love PB&U – my favorite is the pb, bananas, bacon and honey! This place is peanut butter heaven! Fluffernutters are the best. You’ve got a unique restaurant. I haven’t tried this place yet but have been meaning to get there with the kids! Always wanted to try PBandU!! Hope I win!! What a great concept. I’d love to try it! I have heard wonderful things about this place. I want to get a group from my office in K of P to take a trip over on a lunch hour! Oh yum. Love anything and everything peanut butter– GO SUPER CRUNCH! I’ve been wanting to check this place out for so long! It sounds absolutely delicious! My son doesn’t eat anything else for lunch but peanut butter. He would go crazy at this place! Sounds really fun, would love to venture over to Wayne and try it out! Hands down nothing beats the classic PB and Fluff! LOVE PBabdU – wheat bread, chocolate on, fluff and m&ms! The best combination of all! My husband would absolutely go gaga over this place! We’d love to try it out! Thanks! My mouth is watering from the picture alone! Can’t wait to try it! Been meaning to try this place! It sounds amazing! Have been wanting to try this place! Peanut butter is the best! It looks so good and special. Would love to try! I would enjoy sharing this with my family! Yummy to the Tummy – pick me! I’ve always wanted to go there! Would love to take my son for a mommy/son date! Would love to win! Thanks for the opportunity to enter! PB and J my favorite sandwich! I would love to try this restaurant. My kids love that place, would love this! Nom, nom, nom… love PB&U! love PB&U! The PB, bacon and cheddar rocks!!! I was just telling my children we have to try this place! Yummy and hope they have gluten free bread!